Yesterday I wrote about L coming down with a temperature one day while he was staying here. What I didn't write was that yesterday his Aunt K woke up with a temperature and spend the entire day in bed. This morning she still has a temperature in is once again spending the day in bed. Also about an hour ago L's Grandma came into the den and announced that she also has a temperature. She is now in bed as well. However L's Grandma didn't go to bed until after she had contacted our entire Mini-Church to tell them we would not be meeting this afternoon because we have the flue. This is one of the problems with scheduling Mini-Church once a month during the summer. If for some reason you have to cancel the meeting suddenly become 8 weeks apart. I certainly hope that I will be spared this flu. I am always afraid that once I get sick, I will end up in the hospital. So in an attempt to help prevent me catching the flue we once again have the Sanitizing Wipes out and I've cleaned my computer, the phone, and all the remotes. Of course yesterday, before P realized she was sick, she did the entire end of the month items. She replaced my vent circuit, and my trach. This morning she replaced my drain sponge, and trach collar and all the associated items that are required. I know I have been exposed to the flu, I just hope I don't come down with it. This past week our 3½-year-old grandson L stayed with us. He road the 3 hours from his home with his two uncles who had spent last weekend camping with L’s father. If I have the story correct, his uncles picked L up after church Sunday morning. When they arrived, he walked out the door with his suitcase in hand. His mother had to follow him out to the car to get a goodbye kiss. He was a little disappointed having to ride in his Uncle K’s car because he wanted to ride in his Uncle J’s car. The uncles solved that problem for him by stopping at Uncle J’s apartment and switching cars. It is amazing the amount of power being the only nephew gives a person. L arrived late Sunday afternoon and spent the remaining time settling in at his grandparent’s house. At one point Sunday evening I heard him telling his grandmother that he missed his mother. When I woke up Monday morning the den was empty and I found L sleeping in grandma’s bed. L must have heard me making my morning coffee because just as I settled into my chair for that first cup, he came into the den telling me that he had a good night’s sleep and could he watch some TV. So I sipped coffee and watched children’s programming with him. Later Monday morning, L, his Grandmother, his Aunt K, and the two children she is babysitting this summer took the train downtown to the aquarium.. They didn’t return until late in the afternoon and then L spent the rest of the day telling me all about the train ride and all the things he saw and did at the aquarium. The rest of the L’s week was busy with going to the gym with Grandma, going shopping for bridesmaid’s dresses with Grandma and Aunt K. One day he helped Aunt K wash the outside of the windows, he spent time in the wading pool, helped Grandma plant some things in a planter. He was basically either Grandma or Aunt K’s shadow. Unfortunately Wednesday he woke up with a headache and a 101+ fever, so he spent the entire day either sleeping or resting. However Thursday morning he woke up and told us that he was feeling better and his headache was gone. All the other times L stayed with us or we visited him, he would just accept my wheelchair, ventilator, and Foley as being normal for Grandpippy. However, he must have been thinking about why his Grandpippy wasn’t able to walk. A couple of time this past week he would tell me that I needed to watch him so he could teach me how to walk. He would say, “Grandpippy if you learn to walk you won’t need your wheelchair anymore”. After telling me this he would say “Watch how I walk Grandpippy” and then he would slowly stride around the room-using long exaggerated steps. “There” he would say, “if you learn to walk like me you won’t need your wheelchair.” Later I heard L asking Grandma why his Grandpippy couldn’t learn how to walk. After all L was a little guy and he had learned to walk. Thursday evening after supper, L stayed home with me while his Grandma and Aunt went looking for material that might be used to make the bridesmaid dresses. So L and I stayed home and watched the movie “Night at the Museum.” There were times during the movie when L was a frightened enough that he wanted to sit in the recliner with me. After watching the movie for a while, he became bored with the movie and went into the other part of the house and started messing with the vacuum cleaner. Just when I was starting to transfer from the recliner to the wheelchair so I could find out what he was up too his Grandma and Aunt opened the front door. Friday evening his parents drove down and this afternoon they left to spend a couple nights at a downtown hotel with his other grandparents. So now our house is much quieter and emptier also. I remember how I would look forward to spending time with my grandparents. In fact I have a vague memory of my Uncle Bill taking my older brother and me to a White Sox baseball game. I have stronger memories of walking in the back doors of both of my Grandparents houses. One lived in town and the other on a farm. What I remember most about those houses is the way each house had it’s own odor. So I hope L has great memories about being young and spending time with his Grandparents, Aunts and Uncles. Maybe he will have a vague memory of teaching Grandpippy how to walk. Sunday morning I went to church and as I was going into church, I met a friend who had just had an operation on his foot. My friend was in a wheelchair so I challenged him to a wheelchair race. My friend was certain that he would win, but when I won, he claimed I had jumped the start. However, even if I had, I don’t believe he stood a chance of winning. I say this because as we were racing, I kept pulling further and further away from him. This wasn’t the first time I was in a wheelchair race. When I was 12 I spent 6 weeks in the University of Iowa Hospital when I had both hip operated on for Slipped Capital Femoral Epiphysis. I spent the six weeks in a ward with a number of other children. As happens when you have a number of kids confined to crutches, or wheelchairs, boredom sets in. So it was decided that another wheelchair bound boy and myself would have a wheelchair race down the hall. As the others watched the two of us started racing down the hall. However, our race came to an unexpected stop when we ran into a nurse who walked out of a room into our path. Fortunately the nurse wasn’t hurt, however we had our wheelchairs taken away and were confined to our beds for the rest of the day. The next afternoon after we had regained our freedom and were back in our wheelchairs, we were sitting watching television. One thing led to another and someone suggested we attempt to balance our wheelchairs on the rear wheels. As you would expect both of us promptly fell over backwards. And also as expected we both were confined to our beds again. After that I don’t remember anymore issues with wheelchairs. However, as I look back on that hospital stay now, I can only imagine how glad those nurses were when we were discharged. Years later after I was married and had two young boys we took a vacation to Washington DC. While in Washington DC we visited the National Zoo. Because of my hip problems I would always take a wheelchair whenever we were someplace that required a lot of walking. There I was in a wheelchair being pushed by my two young sons. The Washington Zoo has hills and so the boys would push help push the wheelchair. However, sometimes when we would be going down the hills they would let the wheelchair go letting me free wheel down the hills faster and faster. I would always let them think I wasn’t able to stop the wheelchair. However, I was no-longer 12 years old and knew the dangers of running into people with a wheelchair so I always had the wheelchair under control. I still can see both boys standing at the top of a hill laughing and laughing thinking they had pulled a fast one on their father. Even though I wouldn’t let a wheelchair run away down the hills of the Washington Zoo, I still have enough child in me to race someone else in a wheelchair into church. I did it. I made it to Church yesterday. For some reason I was having trouble talking. I have been having more and more trouble talking. It is such hard work and so exhausting that I find myself actively avoiding conversations. So yesterday in Church I just smiled a lot and gave people the raised thumb indicating that I heard what they were saying. Just before the church service started, our two middle sons tapped my on the shoulder asking me to move so they could go sit next to their mother. After church the two boys and their sister were home for dinner. We had beef and vegetable kabobs with a nice Israeli Couscous Salad and a broccoli salad. For dessert we had one of my favorites, pecan pie. After lunch the boys and I watched part of a baseball game. What fun that was. 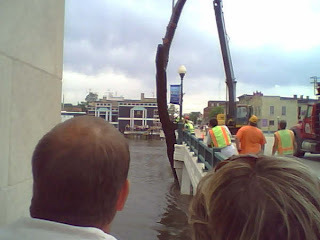 Yesterday evening my oldest son called to wish me a Happy Father’s Day and to tell me how he and grandson L spent almost an hour watching a crew remove a 30-foot log from under a flooded bridge. 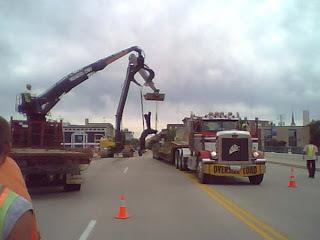 I guess the crew started with one piece of equipment and ended up with many pieces of equipment in the attempt to remove the log. I understand my grandson was happy because he really loves watching construction equipment. Over night the weather cleared and today the sun is out, it is cooler and we have turned off the air conditioning and opened the windows. As I write this I can once again hear the birds singing in the bushes. I think I am starting to wander a bit so I am going to Post this and stop. Wednesday afternoon the front door opened and in walked my Uncle B. He was on his way to a store to look for some new light fixtures to put in their basement. He and I had a nice visit catching each other up on the family news. I didn't think I had talked too much, but think I talked more than I thought. Then yesterday afternoon a friend called and asked if it would be OK if he came to watch some baseball with me. So my friend showed up we watched the baseball game and I let my friend do most of the talking. I tried to answer with “yes” or “no” or nodding my head. However, I must have talked more than I realized because by 8:00 last night, I could not keep my eyes open enough to read. And what I was reading didn’t make any sense to me. Now here is it 8:30 in the morning and I, after sleeping like a log for 9 hours, have already taken a 20-minute nap. I think that is one of the worse aspects of this disease, the not knowing when you will do something that will just land you flat on your back. I was hoping to help P by folding a couple of baskets of laundry, but now I think I better just sit here and try to rest up. I need to rest up because I really want to get to church Sunday. This Sunday is Fathers Day, and I think the boys will come for dinner. Which means I probably will do a bit more talking than is good for me. Time to post this, do a Sudoku puzzle and try to figure out what to do with the rest of the day. You will notice from the previous post that I had been to the Emergency Room on Sunday and when P and I returned home found the Mini Church picnic at the house. Monday morning I did not feel any better, my throat was worse, but my temperature was a bit lower. I thought well let’s not panic, lets give the antibiotics a chance to work. Tuesday morning P was teaching a class at the banks home office about 45 miles away on the other side of Chicago. She called me during a mid-morning break to see how I was doing. Because I felt worse and because my temperature had reached 102 F. we decided it was time for a return trip to the ER. She called our church asking them to arrange for someone to come and take me back to the ER. After spending another 4 hours the doctor said the throat culture, they had taken Sunday, showed that I had a yeast infection in my throat, gave me a prescription for another antibiotic and sent me home. This doctor also told me that my Pulmonologist would be calling me later Tuesday afternoon. We live about 3 miles from the hospital and when we arrived home there was a message on the answering machine from my Pulmonologist asking how I was and asking us to call back. When we did the Pulmonologist had already left the office, so P went to get the new prescription filled. As P was pulling back in the driveway the phone rang and it was my pulmonologist who told P she really wanted me admitted to the hospital. However, the hospital where we had gone did not have any available rooms, which was the reason they sent me home. P and I discussed this and decided that if my doctor could admit me to another hospital that would be fine with us. By 7:30 Tuesday night I was in a CCU bed in the other hospital. I spent 3 days in the hospital on IV and oral antibiotics. I was discharged late Friday afternoon. . Friday when my doctor was discharging me from the hospital, he told me that we had caught this infection early, and stopped it before it had time gain much strength. Today I feel much better but still get tired easily. Thinking back on this entire experience, I think the best part was the picnic our Mini Church had at our house when we were not there. As I have mentioned before, we attend a large church. The average attendance on a weekend is 4000 people. Such a large number of people makes it difficult to meet others so people tend to get lost in the crowd. The church feels that one of the answers to this “getting lost” problem is having Mini Churches were a group of 10 – 12 people meet in a home for a time of Christian fellowship. We have a Mini Church that meets in our home a couple times a month. I like the idea of once a year not having a lesson or discussion. Yesterday June 1st we were having our annual picnic. Because of all the fun medical equipment I require we always have the picnic at our house. Everyone brings one or two of their favorite or best dishes providing enough food to feed a small army. It’s great fun, and I just love it, you get to talk to others about things that do not come up in the normal Mini Church setting because the group dynamics are different. P decided to not use the grill, instead we would to a Deep Fried Turkey. We’ve fried a turkey before and thought it would be a nice thing to share with the group. Early last week the turkey was purchased and placed in our refrigerator. Last week Friday I noticed I had the beginnings of a sore throat. Because it didn’t bother me, I didn’t think a lot about it. By Saturday evening I was experiencing a lot of pain whenever I had to swallow anything. By bedtime I decided to take my temperature which turned out to be 99.9 F. I am usually 97.7 so I now had a 2-degree increase in my temperature. Sunday morning when I woke up, my temperature had climbed to 100.9 and by late morning reached 101.9. When P came home from church I told her I needed to go see a doctor. The problem was that in a couple of hours we would have a lot of people showing up at our door. We decided to leave the door unlocked with a note telling people to just come in. P called our youngest son K and asked if he would come by to set up the turkey fryer and she called one of the other guys telling him what was up. After these few phone calls we went to the Emergency Room. Of course you go through the normal battery of things once in the ER, chest x-ray, blood draws, urine samples, throat cultures. However, all these things take time, lots of time. The doctor finally came and told us that I had a mild urinary tract infection that the chest x-ray was clear, and the throat culture came back negative for Strep Throat. I don’t believe him on the Strep Throat because he also said that my throat was red, inflamed and had white spots on it. To me that sounds like Strep Throat, but what do I know. We finally left the ER arriving home an hour and a half after the picnic started. It was in full swing. Everyone had helped out; they told P that they had a lot of fun hunting through her kitchen cupboard looking for different items. Son K had showed the guys how to fry the turkey and then he had to rush off to pick up a friend at the train station. The turkey was great, as I said earlier, there was more than enough food. My only regret is that in all the busyness I forgot to grab my camera and take some photos.